The blazer is the perfect outerwear for those mild days where you don't fancy wearing a jacket or when you want to smarten up a casual outfit. I did a post last year on the essential black blazer but this year I wanted to show some more inspiration on the blazer in general, whatever the colour. I still have my black Topshop tuxedo style blazer (similar ones here and here) that I should wear more often but don't. The dogtooth patterned blazer below is also another one I have kept but again need to wear more often. 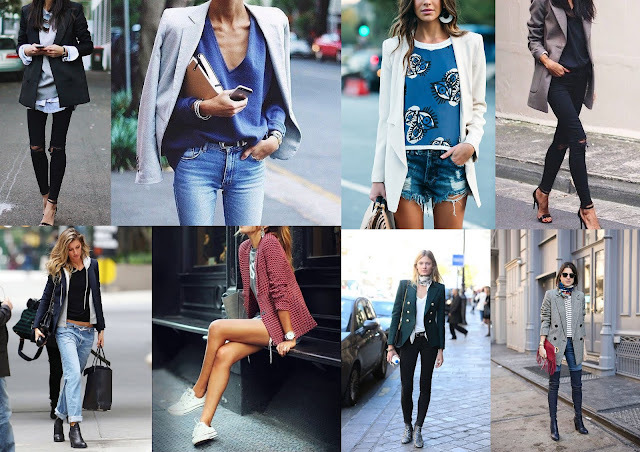 If you feel the blazer is too smart and only for work, try wearing with jeans and trainers or you could wear it over a hoodie. I love the way Miroslava Duma styles the blazer look, effortless, stylish and beautifully put together. She dresses her pinstripe blazer with a simple white t-shirt and jeans, the left image she teams it up with trainers and the right she pairs with heels. The blazer makes all the difference in this simple outfit. If you want to play it safe always go for black or navy, coloured blazers look equally good too. 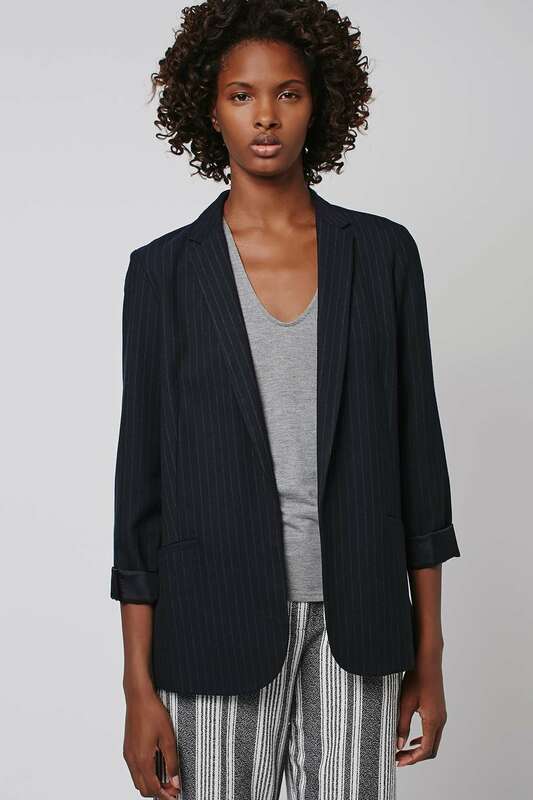 This linen blazer from Zara is a great summer jacket that's not too heavy, throw over a summer dress or skirt. Pinstripes are big this season as mentioned in the previous post on 'striped trouser', this blazer from Topshop is perfect for a casual outfit, just turn the sleeves up or push back. This one is a bit pricey and not at all high street, very Chanel and can see it lasting a long time, a classic shape and style by Isabel Marant priced at £260. I love the frayed edges and double breasted front, smart but at the same time very admirable and edgy. Lastly, if you want colour or something different try either one of these from ASOS, will go nicely with denim or leather trousers. The below pyjama blazer looks like it will drape nicely on, not fitted and a perfect summer jacket. Not only was it the colour that drew me to this blazer it was the belt detail too, absolutely love this style which brings me to my favourite blazer inspiration below. The below look with the lace is just perfect, why not try belting your blazer?